Have you seen legs like these in your practice? 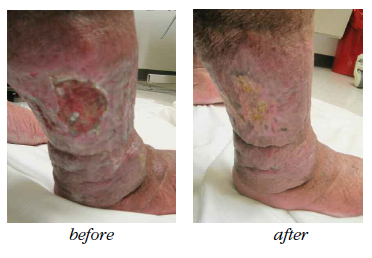 These legs show lymphedema and chronic wounds before treatment (left image) and after treatment (right image) with complex decongestive therapy (CDT)—the gold standard of lymphedema care. The patient benefited from multidisciplinary collaboration between wound care and lymphedema therapists. Part 1 of this series (published in the May-June edition) began a discussion of the importance of multidisciplinary collaboration when treating lymphedema and chronic wounds, explained how the anatomy and physiology of the venous and lymphatic systems support this concept, and discussed the global impact of venous stasis ulcers and lymphedema. In this article, I revisit the goals common to lymphedema therapists and wound care clinicians, discuss how collaboration in multidisciplinary treatment centers can enhance patient outcomes, and describe CDT as an example of collaborative treatment. hospital-based part-time staff, including dermatologists, surgeons specializing in wound care, podiatrists who treat foot and nail problems and customize footwear, orthotists, laboratory technicians, dietitians, physiologists, social workers, occupational therapists, and administration personnel. During their first visit to the center, all patients were seen by an experienced nurse and physician. Based on the patient’s individual needs and condition, other healthcare practitioners conducted additional assessments. Data analysis found all patients needed at least one additional assessment and 92% needed at least two. Patients with severe lymphedema, complications, or uncertain diagnoses received CDT in the outpatient clinic or inpatient ward. When maximal edema reduction and therapeutic benefit were achieved, patients transitioned to the second CDT phase and entered an individual follow-up program. increased awareness and improved care of patients. 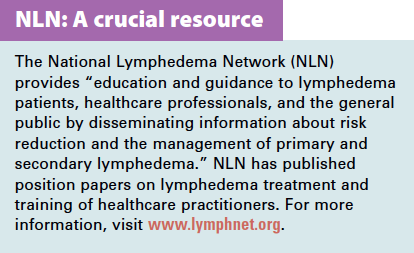 CDT should be performed by a practitioner who has had at least 135 hours of advanced training in lymphedema, according to the National Lymphedema Network. 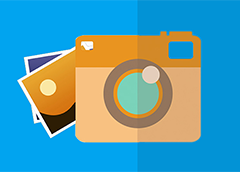 (See NLN: A crucial resource.) CDT consists of two phases. Phase 1, an intensive treatment phase, aims to improve skin integrity and tissue texture, reduce edema, and prevent infection. Phase 2, a maintenance phase, aims to prevent wound and edema recurrence, prevent long-term infection, and improve quality of life. This phase has four components: skin and wound care, exercise, manual lymphatic drainage (MLD), and compression bandaging with multi-layered, short-stretch bandages with foam. When the patient’s edema reduction plateaus, tissue texture improves, and wounds heal, as assessed by frequent volumetric measurements, tissue texture assessments, and regular wound assessment. Clinicians measure the affected limbs and fit them for appropriate compression garments for both daytime and nighttime compression. Compression garments may include flat-knit compression stockings, bandage alternative devices, or both. This treatment transitions the patient to phase 2. During this phase, the patient receives education on edema self-management, skin care, and exercise. In some cases, as determined by the practitioner, the patient learns how to perform MLD and uses an intermittent pneumatic compression device (IPC) at home. In about 6 months, patients should visit the clinician for reassessment and new compression garments. A systematic review of the literature supports bundled CDT components as an effective lymphedema treatment. 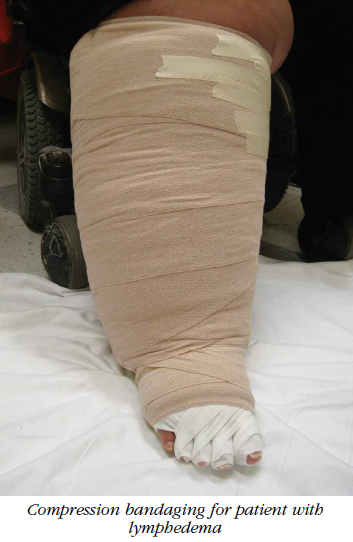 Multi­layered compression bandaging with foam is a strong component of CDT for edema reduction. A study by Partsch et al. (2008) found a multilayered compression-bandage pressure of 38 mm Hg or higher increased blood perfusion in the normal limb. How this translates to patients with subcutaneous fibrosis with combined venous and lymphatic edema (phlebolymphedema) isn’t clear. However, the authors concluded that in the standing position, higher pressures more effectively narrow leg veins, reduce venous reflux, and enhance the venous pump. 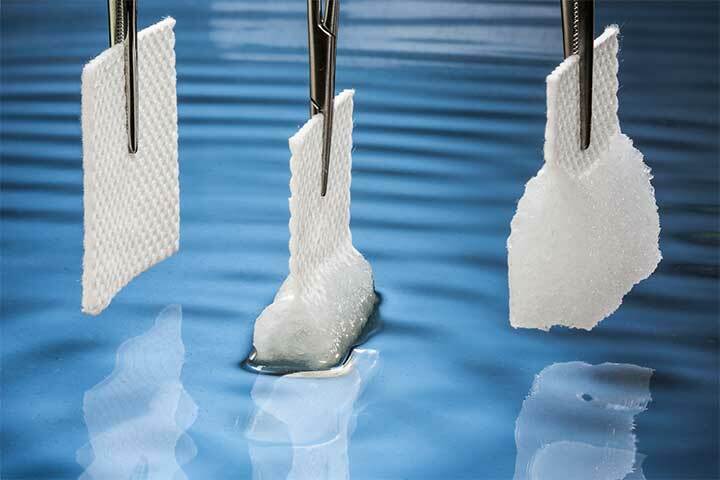 Higher pressures suggest materials with greater stiffness should be used, such as short-stretch, multilayered compression bandaging, custom flat-knit compression garments, and bandage alternative devices. Another study by Pawel et al. (2013) concluded that IPC devices, stockings, and multilayered bandaging are useful and effective in treating venous leg ulcers, whereas two-layer, short-stretch bandages and Unna boots are ineffective. Literature on collaboration between lymphedema therapists and wound care clinicians is minimal. 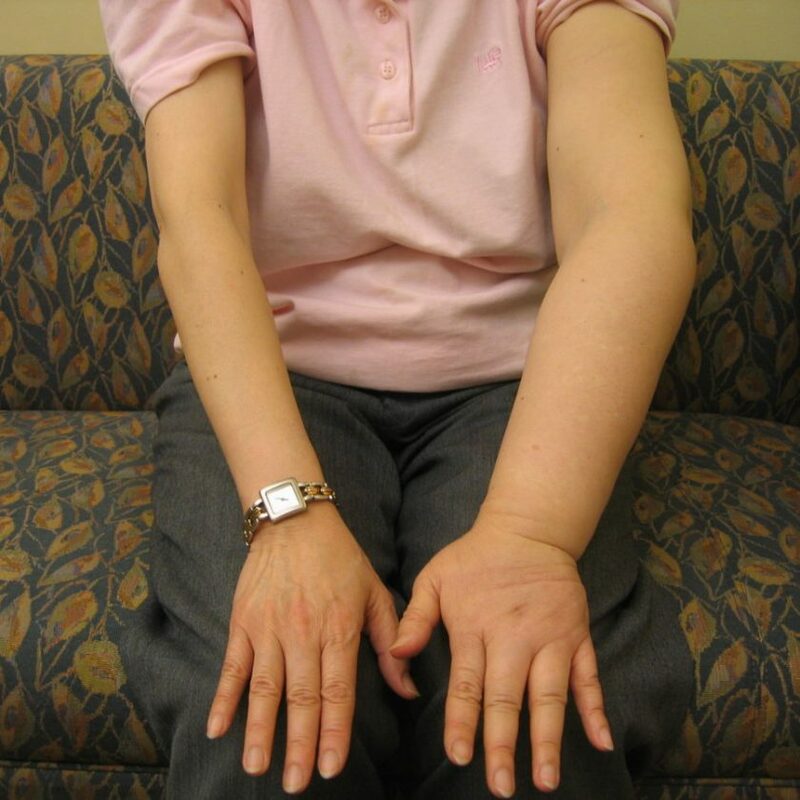 Lymphedema management has never belonged to any medical specialty, and only recently have U.S. clinicians become more aware of this disorder and its management. But that’s changing. If you Google “lymphedema and wound care clinics in the U.S.,” you’ll find more of these clinics are being developed throughout the country. Multidisciplinary centers with collaborative teams have a place in the future of health care. Consider how a multidisciplinary setting for lymphedema and wound care could enhance your practice and improve your patients’ quality of life. Erin Fazzari is a physical therapist at Good Shepherd Penn Partners: Penn Therapy and Fitness, in Philadelphia, Pennsylvania. Birkballe S, Karlsmark T, Noerregaard S, Gottrup F. A new concept of a multidisciplinary lymphoedema center: established in connection to a department of dermatology and the Copenhagen Wound Healing Center. Br J Dermatol. 2012;167(1):116-22. Farrow W. Phlebolymphedema—a common underdiagnosed and undertreated problem in the wound clinic. J Am Col Certif Wound Spec. 2010;2(1):14-23. Foldi M, Foldi E. Foldi’s Textbook of Lymphology: For Physicians and Lymphedema Therapists. 3rd ed. Munich, Germany: Urban & Fischer, 2012. Lasinski BB, McKillip Thrift K, Squire D, et al. A systematic review of the evidence for complete decongestive therapy in the treatment of lymphedema from 2004 to 2011. PM R. 2012;4(8):580-601. Law K. Addressing the Whole, Not Just the Hole: A Collaborative Approach for Patient Success [Lecture]. Penn Medicine at Radnor, Radnor, PA; 2014. Partsch H, Flour M, Smith PC; International Compression Club. Indications for compression therapy in venous and lymphatic disease consensus based on experimental data and scientific evidence. Int Angiol. 2008;27(3):193-219. Pawel D, Franek A, Kolank M. A comparative clinical study on five types of compression therapy in patients with venous leg ulcers. Int J Med Sci. 2013 Dec;11(1):34-43.